In 2017, Germany passed a law that tightened regulations on fur farms, essentially making these businesses nonviable. Farms were given a five-year window to close their facilities, but they all complied quickly. All, that is, except for one mink farm in Rahden/North Rhine Westphalia. When Care2 member Patricia L. discovered that animals were being held in horrific living conditions before being subjected to a gruesome death from gas poisoning, she created a Care2 petition demanding the farm’s closure. No one should enrich themselves through animal suffering and I think this owner belongs in prison. I still do not understand why some humans take the liberty of determining which animals we love, which ones we eat and which animals we skin while being alive. Who gives us the right to do so? Over 1,300 Care2 members agreed with Patricia and signed her petition. Meanwhile, animal activists around the world have also been putting pressure on German authorities to close this facility. A huge thank you to all you Care2 members who signed this petition and ensured that these minks will now live free. While Patricia’s petition has helped ensure the end of fur farming in Germany, numerous fur farms still exist around the globe and hold animals in atrocious conditions. Many celebrities and companies have now gone fur-free, but horrifyingly, the fur industry is still going strong worldwide. In fact, 85 percent of the skins used in the industry come from animals trapped inside fur farms. These are generally small and family-run operations. On these farms, millions of wild animals are held captive in terrible conditions before being killed using brutal methods. 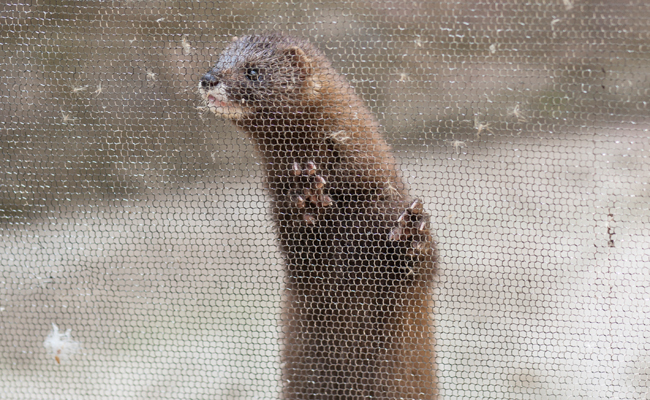 Two of the most common species trapped inside fur farms are minks and foxes. Unlike in Germany, there’s no federal law against fur farming in the U.S., and around 275 mink farms exist in 23 states. These farms produce close to three million pelts annually, which were valued at over $300 million in 2013. Fortunately, the state of Hawaii is working to change that. Senator Mike Gabbard recently introduced SB 1350, a bill which would ban the manufacture and sale of certain fur products in Hawaii, as well as the import of fur products for sale or distribution. If you applaud this move by Hawaii to effectively ban fur products in the state, please sign this Care2 petition to help protect fur-bearing animals from torturous conditions. And remember, if you’re inspired by Patricia’s success, you can always start your own Care2 petition about a cause that you feel passionate about. Check out these guidelines and soon you’ll find the Care2 community signing up to support you. My heart is smiling ! Good news, tks for sharing. I've just signed this petition. What wonderful news! There is no need to have fur farms in any country. Fur farms should be banned everywhere! !